For many years, we’ve been providing exciting and luxurious cruises along the shore of the Cape Peninsula, helping travellers and locals experience Cape Town in the most unique way. Our state-of-the-art TIGGER 2 Royale vessel offers luxury comfort and style. Throughout the years, we have helped thousands of people get up close and personal with the beauty of the Cape Peninsula, helping them to explore Cape Town in a way that few people are ever able to. The TIGGER 2 Royale is a 55-foot luxury Power Catamaran that was launched in November of 2008. At present, she is the flagship of the charter boat industry operating in the Victoria & Albert Waterfront. Her beautiful exterior and plush white leather interior beautifully complement each other, and set the scene for thousands of Cape Town cruises each year. We are able to cater for up to 65 guests at a time, and we’ve hosted many product launches, conferences, weddings, and many other special functions over the years. Should you have a need for a personalised, private charter, we’re more than happy to tailor a cruise to suit your specific requirements. Our team is always at hand to provide our clients with a personalised service, shying away from a one-size-fits-all approach. All departures are from the T-Jetty in front of the Hildebrand Restaurant at the V&A Waterfront in Cape Town. Route options start with a departure from the Waterfront, cruising past Mouille Point, Green Point, Sea Point, Bantry Bay, Clifton 4th Beach, and Camps Bay, or Table Bay, Bloubergstrand, depending on the weather on the day. Should you opt for a full-day charter, we’re even able to cruise all the way around Hout Bay, before heading back to our mooring at the V&A Waterfront. Another popular cruise option is taking a cruise into Table Bay, and along the coast of Robben Island. Please keep in mind that this is strictly a sightseeing cruise, and we are unable to let guests disembark on Robben Island. But it’s still a sight to behold, and a great experience to enjoy. We look forward to hosting you and illuminating a part of Cape Town that you may not yet have experienced. Ever Thought About a Cape Town Wedding Cruise? We help you turn your dreams into a reality. If you are looking for a unique and special way to celebrate your special day with loved ones, we have successfully hosted many weddings and receptions on the TIGGER 2 Royale. We cater for both the extravagant and cost conscious, and can make your ceremony as small and intimate, or large and luxurious as you wish. A selection of buffet-style menus. Floral arrangements and wedding photographer. A selection of wedding cakes and canapé platters. We look forward to welcoming you to a scenic bay cruise as you enjoy the stunning views of Table Mountain, Lions Head and Signal Hill, as we cruise along the coastline. We offer a choice of cruise duration and a variety of menus on our floating restaurant, ranging from a basic braai menu, to more upmarket sushi and canapé platters. Our restaurant can comfortably cater to 65 guests for the buffet-style menu. Enjoy the 90-minute sunset cruise, where we take you straight to Clifton 4th Beach, where scenic views await as you sip on a glass of Méthode Cap Classique sparkling wine. 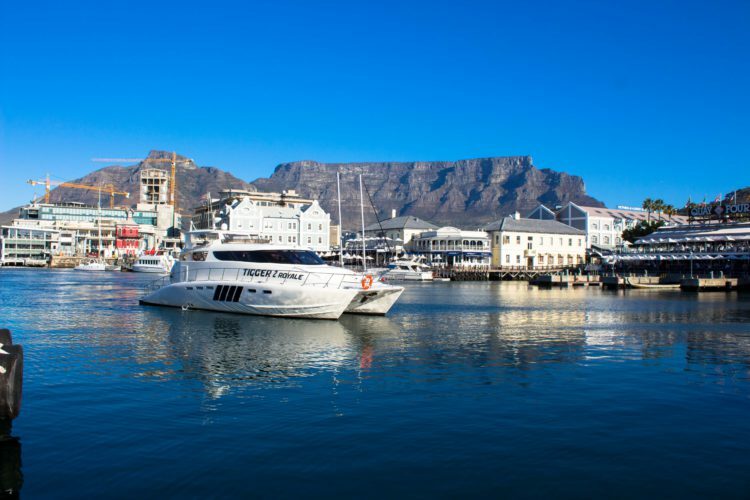 These are only a few of the many Cape Town cruises awaiting you. Look forward to making beautiful memories that are sure to last a lifetime. If you would like to learn more about our charter cruises, and enjoy access to all the information needed to make an informed decision regarding your cruise needs, contact us today, so that we can assist you in planning your trip. We look forward to helping you experience Cape Town in one of the most unique ways available.